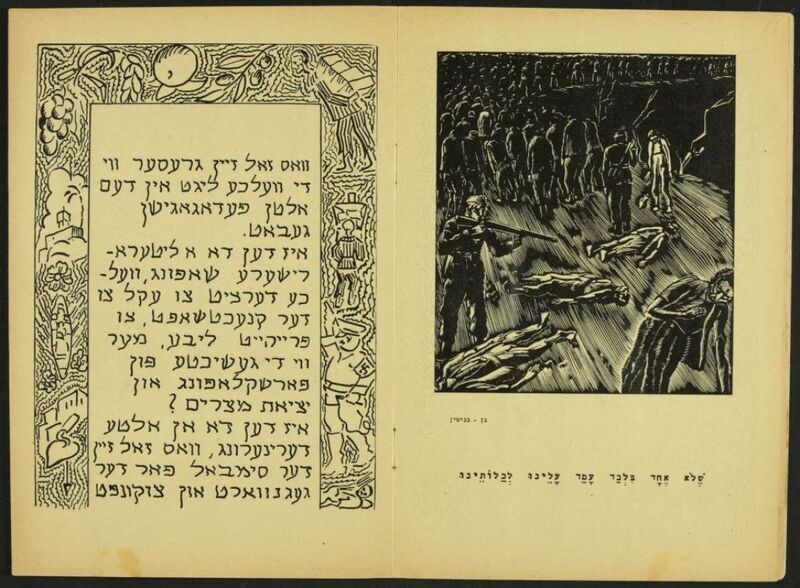 Depicting the horrors of the Holocaust, which he himself experienced during the war years, Adler’s harsh drawings complement the text of the haggadah. One such example is an illustration that corresponds with the well-known sentence “for not only one has risen against us to destroy us.” The illustration depicts a soldier shooting several wretched looking prisoners, while another soldier leads a group of stooped prisoners toward an unknown destination. The picture gradually fades as the prisoners move away from the center of the event. The intertwining of traditional text and modern pictures expresses the way the creators of the haggadah grasped the historical moment during which they lived: in each and every generation a person must see himself as if he left Egypt, but it is not in every generation that a person undergoes horrors that darken his world and dwarf the suffering experienced by his ancestors. While this excerpt from the haggadah is dedicated to praising and giving thanks to God for redeeming us from Egypt, the expression on the face of the survivor at the bottom of the drawing shows quite the opposite sentiment. 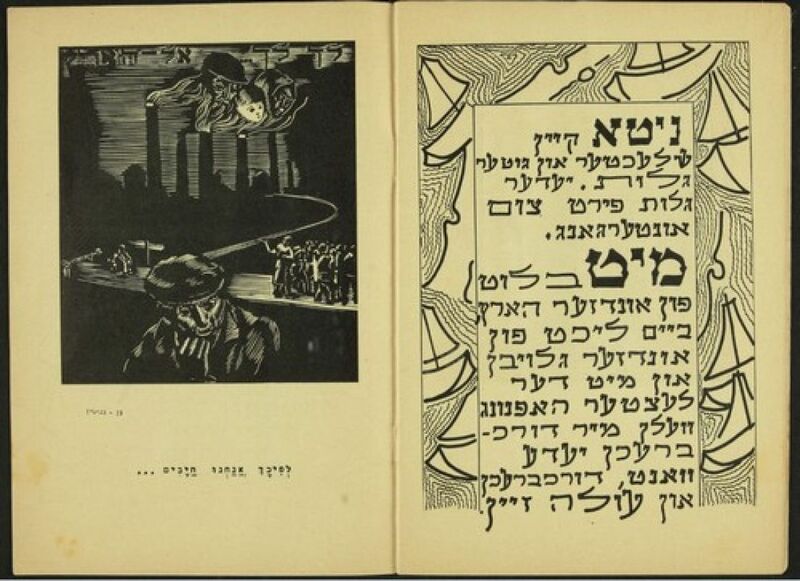 A copy of this haggadah reached Rabbi Avraham Klausner, an American army chaplain who was in the midst of preparing for the Seder of the American army stationed in Munich. 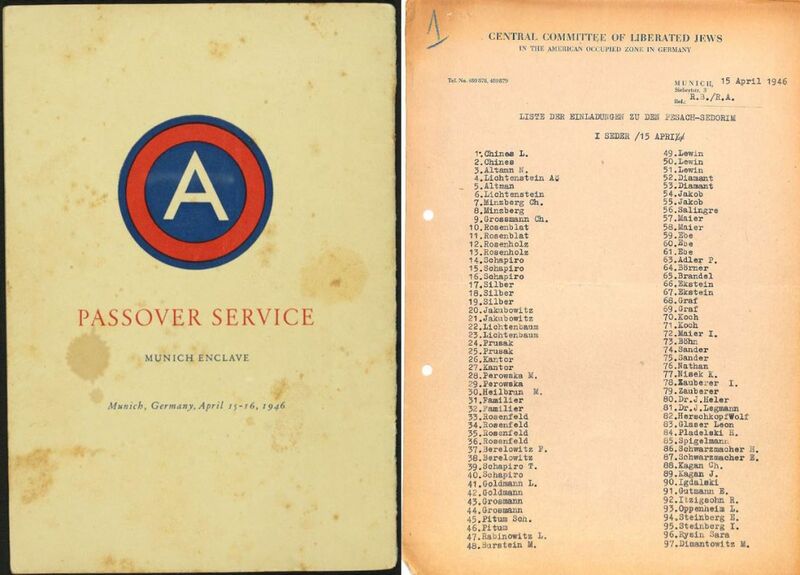 He decided to conduct the Seder according to this haggadah, making a single change – he added an introduction addressed to soldiers in General Eisenhower’s army (whom Klausner compared in his introduction to a modern-day Moses). Rabbi Klausner’s introduction is in the same vein as Sheinson and Adler’s work, equating Hitler with Pharaoh and the suffering the Jews endured in Egypt with what the tragedies Jews underwent in the concentration and death camps. The list of those invited to the Seder conducted by Rabbi Klausner in the Munich Theatre, held on the same night as the Seder of the displaced persons camp in Munich, is preserved in the Central Archives for the History of the Jewish People. It shows that only a few of the five hundred participants of the Passover Seder conducted by Rabbi Klausner were Holocaust survivors. The majority were soldiers in the American army. The letter A was stamped on the title page of Rabbi Klausner’s private copy, indicating the American army. On the same title page are the date and the location of the Seder night at which the haggadah was used: Munich, Germany, April 15-16, 1946. Rabbi Klausner’s personal copy is currently stored in the Haggadah Collection of Israeli collector Aviram Paz. It was lent to the National Library for its “Next year we will be free men” exhibition – an exhibition of unconventional Passover haggadot from the years before the founding of the State of Israel.